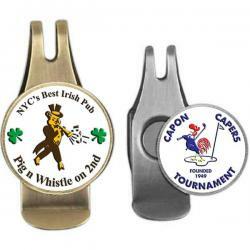 Put your logo on our wide selection of Logo Golf Hat Clips for your next golf tournament, event, outing or promotion. Our Custom Golf Clips can be completely customized in the shape of your company or tournament logo including the ball marker. 4. Your golf hat clips will be produced and shipped followed by a tracking number sent by email. This timeless design produces a hat clip & ball marker combination that is a great match for any Club Lorente ball marker design. Each clip includes your custom-made 7/8" Club Lorente ball marker. ..
Ball Marker Cap Clip - Golf Tournament Gifts.. These customized and stylish clips conveniently attach to your visor or your pocket, clip to your belt loop, slide on to the side of your hat or any other accessible location. Great for holding your ball markers! Make great gifts for your next golf t..
Engraved Custom Logo Golf Ball Marker Hat Clip - Golf Tournament Gifts..